This sector offers varied careers working in museums, galleries and stately homes. Experience is essential if you want to secure a graduate job in this sector you will need to apply for internships or work placements. The key to getting into this sector – museums, art galleries, historic buildings and conservation – is to gain relevant experience. 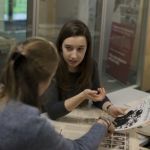 This must usually be through volunteering, but there are some paid posts available for students and graduates – English Heritage, for example, regularly recruits Seasonal Custodians to work at sites including Dover Castle and St Augustine’s Abbey. There is no defined entry route, but those who succeed are highly qualified, motivated and determined. Competition for jobs is fierce, and the pay is often low. Unpaid internships - either before or after graduating - are often the way into this area. Most auction houses have unpaid internship schemes, which can be a route into permanent positions. Museums and historic houses also run informal or formal volunteer schemes or internship schemes. What made you interested in 18th Century British Art? Are you also interested in other periods and styles? What are the key elements of successful event organising? Have you been involved in organising art events in the past? In what way? Some of our clients are representatives of equity funds, curators of national galleries, bankers and business men. What are, in your view, the key issue to remember when working with these groups? British Association of Picture Libraries and Agencies, the trade association for picture libraries. The museums association champions the value of museums and develop their employees. The AAH plays a key role in helping shape and secure the future of art history and visual culture.